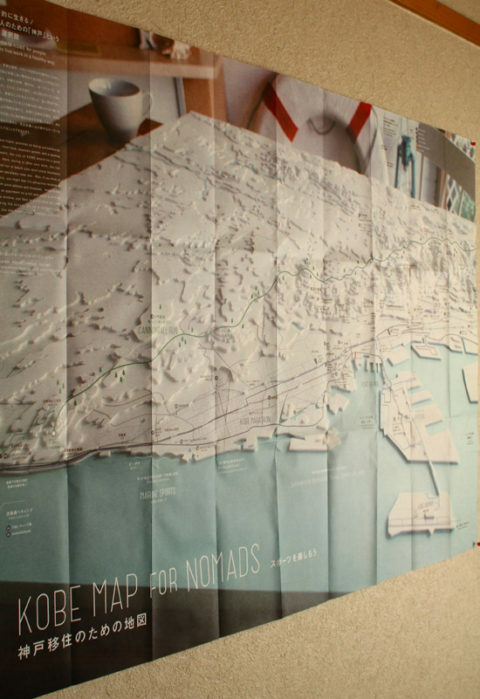 H& Architects & Associates has been published on “Kobe Map for Nomads” organized by Real Kobe estate. The beginning line of the map goes as “”This map is for nomads who are considering to change living/ working addresses with priorities such as fresh air, nature sporting and family environment.” with a picture of the houses sitting on the slope of the Mt. Rokko. Mr. Koizumi, the representative of Real Kobe estate has lived in many cities including overseas and he finally stopped moving when he got to Kobe. Once he told us the beginning of producing this map was his desire that would like people to share this comfortableness of Kobe, and wishing them to moving in to Kobe like he did. Two sides of the map is full of information of real good shops not like a sightseeing map but for the people who are living in Kobe, and introducing an example of how you can spend your weekends with walking, biking, climbing and trail running in the city of Kobe with indicating the recommended routes. We are also the one who chose to live in Kobe and this map telling us the shops we haven’t been, and it makes us happy since we feel as if our reasons to live in Kobe finally forms a shape as a map. This map might be distributed all around Kobe by Mr. Koizumi, we wish you’ll find one, have fun with it and wish you’ll move to Kobe! Photo: Kobe Map for Nomads.